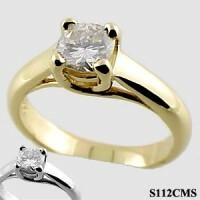 Stock #S112-Cms :Lucern style solitaire ring for 1 carat/ 6mm cushion cut Stone. Heavy ! Top quality ring. Takes 2-5 days to prepare. Other sizes available by special order.